RUVIVAL is one year old! 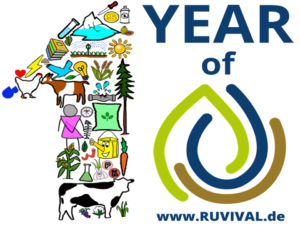 One year RUVIVAL – that means one year of open education for reviving the rural! Exactly one year ago we set out on a digital mission to spread the knowledge necessary for restoring degraded areas and creating new, not just inhabitable, but liveable spaces. Since the beginning, we offer you new learning opportunities on a weekly basis and not so long ago we passed our first 100 post milestone! So what has been going on at RUVIVAL in the last year? Our project has been developing through 5 different, but mutually supportive parts: Toolbox, Interactive Lectures, Reading, Simulation Game and Project Consultancy. The Toolbox contains practical knowledge and methods to revive the land, use synergies and develop rural settings. It is developed through collaboration with Master students, doctoral students and researchers at the Institute of Wastewater Management and Water Protection (AWW) of Hamburg University of Technology. Interactive Lectures are envisioned as a virtual classroom, where students “attend” the lectures given by guest lecturers. Lectures are usually concerned with broader and more interconnected topics and designed to provide you with comprehensive knowledge on various topics related to rural development and reviving the rural. The Simulation Game takes place in a simulated world, where different groups of users plan New Towns in different climates. The groups exchange their knowledge, as they experience similar obstacles in the planning process, despite being in a different environment. The aim of the game is to plan a small New Town with an ecological design using system thinking and synergetic effects of resource cycles. Project Consultancy connects students and non-commercial projects for knowledge exchange and practical experience. Existing projects can apply for project consultancy collaboration with RUVIVAL if they run an ecological sanitation system, use rainwater harvesting systems, decentralised wastewater treatment or other ecological systems, which could be interesting for further research within this project. This section is still under development and soon new exciting possibilities can be expected. 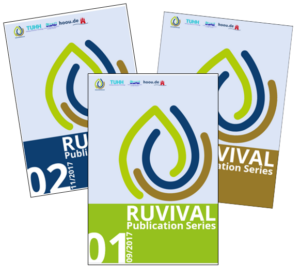 The Reading Section is the newest addition to RUVIVAL and it contains RUVIVAL Publication Series and RUVIVAL Books. You, our audience, just as our production team, come from all corners of the world. This is an additional testament for the global presence and relevance of the sustainable rural development issues RUVIVAL is set to address. It is important to remember that these issues are not taking place somewhere else and to someone else, but here and now and are affecting all of us. Stick around, as we have many exciting plans for the upcoming year. Only together we can revive the rural!